Reason why your Cutting Board Is Hardwood and not softwood. Your fence and deck are most likely cedar. Why isn’t your cutting board? It has to do with the composition of the wood. Hardwood species are best for cutting boards. Here is a look at what types of wood are used and why. The common confusion is that hardwood means the wood in question is unbreakable and very unyielding when you strike it. But actually, the label refers to the type of tree it comes from. The official name for hardwood is angiosperm, meaning a plant that flowers and has broad leaves. This describes maple, oak, and similar trees. Softwoods, on the other hand, are labeled gymnosperms. This means they produce seeds, like pine, redwood and fir trees. The structure of a hardwood is different from a softwood. It has pores that move water. Softwoods use medullary rays, a different method of moisture transport. Here is a look at how the composition of hardwood makes it ideal for hardwood cutting boards. The structure of hardwood has a higher density, which contributes to their sturdiness. They are tougher, able to stand up to the constant cutting action of knives. A hardwood cutting board doesn’t show scratches and nicks like softwoods do. Because this type of wood doesn’t chip and gouge as easily, it has fewer places for bacteria to hide and multiply. Toxins can live and breed in cuts and scratches quite easily. In fact, this is one of the principle arguments against using plastic cutting boards. The cutting surface of plastic easily shows nicks and cuts. Multiple studies have shown that bacteria hides in these areas. Even running the plastic board through the dishwasher doesn’t get rid of the toxins. But hardwood has an ability to partially self-heal from nicks and cuts. This means the surface stays smoother, with fewer places for bacteria to hide. There is an exception. One hardwood that isn’t used for cutting boards is oak. That’s because it has very large pores, compared to maple, walnut, and cherry. You can actually see the pores if you cut across a piece of oak. These make perfect spots for bacteria to collect and multiply. 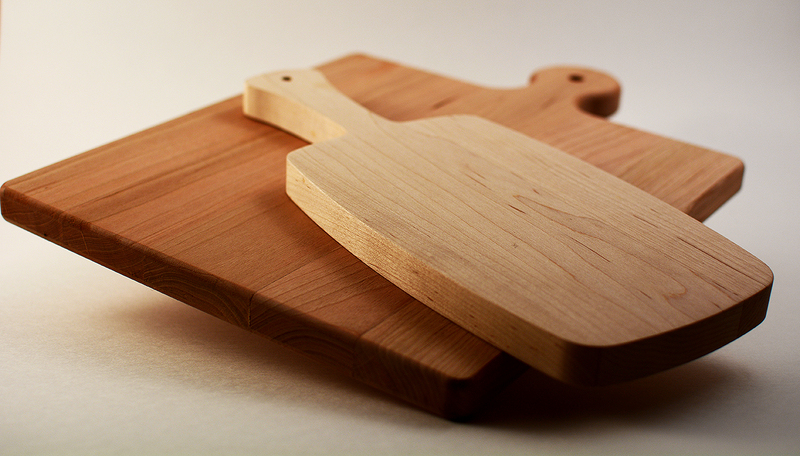 The typical hardwoods used in cutting boards, like maple, walnut, and cherry, are safe for use around food. This isn’t true of some woods like rosewood or more exotic species. Several types of wood can cause irritation or sensitivities. Reclaimed lumber is also a bad choice for cutting boards. Though often beautiful, it can house chemicals. The original wood has often been treated with toxic substances before use in barns, floors, and other applications. The hardwoods used by Wholesale Cutting Boards are sustainable or renewable. Maple, cherry, and most walnuts are not on the endangered list. This isn’t true of many wood type, including many species of teak, ebony, and mahogany. It makes sense to choose a cutting board that is ecologically friendly. Wholesale Cutting Boards takes pride in using sustainable hardwoods, like maple, walnut, and cherry, from Canadian forests. Experienced craftspeople choose the best woods for your cutting board. You know it is safe and durable. Our boards come in a wide range of sizes and styles. You can have them laser engraved with your company logo, an excellent marketing tool. Everyone appreciates a well-made cutting board as a gift, reward or promotional offer. When you buy 25 or more boards from Wholesale Cutting Boards, you tap into bulk savings. And you will never be without a company gift suitable for any occasion. Contact Wholesale Cutting Boards today for a free, no-obligation quote. Our customer service team welcomes your questions. They can help you find the best board to fit your requirements.